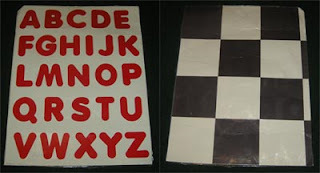 While I know that there are successful methods of teaching phonics for toddlers, we didn't have incredible luck. I made these videos nearly a year ago and have been hesitant to share them because his progression past the point shown in these videos has been very slow. My husband told me that I am not doing myself any favors by only showing my website what works in glowing terms, and he's right. It is actually kind of refreshing to admit that I am not perfect, that everything I do does not work, and to simply say, "That's okay." These videos are a year old when my son was 23 months. He knew all of his letters and recognized a few words. I taught him the sound that the letters make instead of the actual names of the letters. Now at 35 months, he knows all of his letters and recognizes a few words. Sound familiar? Our phonics for toddlers program had some successes, but overall the progress stopped after he learned his letters. At a homeschooling convention, my husband went to a workshop that talked about how the human brain works, and how we build our memories. The average number of things that an adult can remember at the same time is seven. That is actually why our phone numbers are seven digits. For a baby, the number begins at one, and grows from there. This is why putting two words together in speech is one of the milestones that pediatricians look for. Even though the lecture was not about teaching phonics for toddlers, suddenly the reason why phonics was not working for my little boy clicked in my mind. Phonics is better for older children because they can remember more than one thing at once. They can remember "c" while they are reading "a", and they can imply "ca" while they read "t". Babies can't, but they can learn "cat" as a whole word. It is only one thing to remember. This is why my son was able to learn his letters so quickly, but struggled when we went past that point. Parents who are successfully teaching their babies to read are largely using the whole-word method. Be that as it may, I taught with phonics, and I wish to share what we did. We started with the alphabet, and it worked great. I bought a Melissa & Doug Upper & Lower Case Alphabet puzzle and worked with Peter a lot. He loves puzzles, and by doing a puzzle that made him focus on the shape of the letters, he learned them much more quickly. Starfall teaches phonics for toddlers in their free interactive website. We use it a lot, and we love it.Another thing that I did is make an ABC poster. I bought red capital letter punch-out cards from the dollar store and glued them on a 22" by 28" poster. I was expecting a new baby any day when I made it, so on the other side I made a black and white checkered poster to help her visual development. That is part of Doman's How Smart is your Baby? program, and I just throw it in as a side note. I then laminated the poster, and as you can see in the video, it is a good thing that I did. This poster is a "toy", and it has undergone a lot of stress and survived. I took these pictures of the poster when it was more than a year old. Whether your methods use the whole-word or phonics for toddlers, I suggest that the materials need to be durable! When I decided to teach my son with phonics, I chose to use Sidney Ledson's methods. Before I tell you how it didn't work for us, I do wish to say that his methods of phonics for toddlers have worked great for many people, and the two-year-olds who go to his schools nearly all learn how to read. I highly recommend his books, not just for reading, but for math, science, writing, and memory development. We have taken much of his advice in our home and had success with it. Ledson's methods begin by teaching a few letters and then immediately beginning to read simple words with those letters. In his different books, he actually outlines a different order to present them, which is a little weird. However, he consistently presents "The Egg Game" as his chosen way to teach phonics for toddlers. In the video below, it was a success with my son because we only used letters. When we first introduced words, he did alright, but when we added more, he became confused and frustrated, so we quit for awhile. We started again, and quit again in a somewhat frustrating cycle. Meanwhile his education continued in other areas, and we kept his knowledge of the alphabet fresh. Sometimes it was a little refreshing to me when Peter would point out a letter on a sign and people would comment on how great it was that he knew that. I would smile and thank them, but in my mind I would think "Yes, but he can't read yet..." It feels good to publicly admit it on a site so dedicated to early education. My 35-month old is not reading yet, and it's okay! The moral of the story is, Don't compare yourself to others, or you children to other children. With all of the technology we have, it is easy to find videos of babies reading. Remember that this sample is drawn from the whole world! It proves that babies can learn how to read. That's all. I am grateful for the advice I received at this point from the yahoo group Teach your Baby to Read. Many of the parents in this group have been very successful, and I have been inspired by many of them. They suggested that I try Engelmann's famous book, Teach Your Child to Read in 100 Easy Lessons. I tried it, and my son loved it for the first week, but at two-and-a-half, he was too young for it I think. I made videos for him of the first few lessons, and it drew him in for an additional week, but I couldn't keep up with making the videos, and he seemed to tire of them as well. Then I tried scanning in the words in the order that Engelmann suggests, and used them in the egg game. Pictured here, I used a technique suggested by Sidney Ledson where I put a sticker on the left side of the word to help my son remember to read from left to right. He believed that phonics for toddlers should be as intuitive as possible, and this really helped. The combination of these two programs actually worked for almost a month, but as more and more words were presented, he became discouraged and we quit again. I have to conclude that I do not recommend phonics for toddlers. This past year I have somewhat put my daughter's reading lessons on hold while I focused on her older brother, without much success. Now I'm going to give myself permission to forget about phonics for toddlers, but will readdress it when my children are older, if needed. Many parents with children who read as babies say that they intuit the phonics rules when they learn with the whole-word method. I am going to focus on the whole-word approach for both of them now. Maybe a year from now our update will allow me to share a bit more success. We have done well with teaching him to read music, however. I have outlined what I have done with him in my e-book, Beginning Rhythm for Preschoolers. Yes, I can totally relate to your phonics experience. This is what I have experienced with my youngest, and to be honest I did with my oldest. She would have thrived off of Your Baby Can Read had I known about it or even the method of teaching babies to read. Instead I tortured her with phonics and it only drove her to dig her heals in for a very long time. Phonics didn't click for her until she was about 6 or 7 years old. Even then it took her til the age of 9 to read fluently and at grade level. Which is sad beause she is a very smart girl. Even more so she has terrible spelling. My two middle daughters thrived off of learning with phonics. Their brains were just wired that way and they are both good readers and really good with spelling. So with that said I noticed my youngest taking the path of my oldest child and wanted to nip that in the bud. Its great that you noticed that it wasn't working for you so early on. Otherwise you would of ended up with a child who struggled with reading. YBCR is excellent and I look forward to seeing a review of Your Child Can Read on your blog. Learning to read is a long process, but it doesn't have to be a difficult process. Broken down into intuitive and logical steps, a child as young as two years old can learn to read, and older children can accomplish even more. Click here http://teachachildtoreadfast.weebly.com to for a simple, step-by-step program that can help your child learn to read, and watch a video of a 2 year old child reading.